The worst nuclear-power-plant disaster in history. 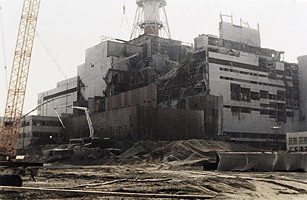 On April 26, 1986, one of the reactors at the Chernobyl power plant in Ukraine exploded, resulting in a nuclear meltdown that sent massive amounts of radiation into the atmosphere, reportedly more than the fallout from Hiroshima and Nagasaki. That radiation drifted westward, across what was then Soviet Russia, toward Europe. Since then, thousands of kids have been diagnosed with thyroid cancer, and an almost 20-mile area around the plant remains off-limits. Reactor No. 4 has been sealed off in a large, concrete sarcophagus that is slowly deteriorating. While the rest of the plant ceased operations in 2000, almost 4,000 workers still report there for various assignments. See TIME's 1986 Chernobyl cover.